If you’re stuck for ideas about where to get your Sunday roast fix this weekend, then give one of these 20 Suffolk pubs a try! Wedged in between Cretingham and Framlingham, The Queen combines high quality, supremely presented food with the serene atmosphere of a traditional country pub. They offer one or more roasts starring the usual meats with many of the vegetables being provided by their own kitchen garden. If you’re not in the mood for a roast, the regular seasonal menu is still available and we think the chocolate nemesis with salted hazelnut would be a fine way to wrap up your Sunday afternoon out. While driving through the Suffolk countryside it’s hard to miss the Bell’s distinctive pink exterior. If that doesn’t lure you in then the well-kept garden out front surely will. Once inside there’s plenty more to interest the eye as beautiful brickwork sits alongside exposed beams, the ideal setting to bring a group for a generously portioned, steaming hot Sunday roast accompanied by one of the many local ales available. After a morning exploring Aldeburgh and the Suffolk coast, why not make the short drive inland to Snape for a little Sunday lunch magic? The dog-friendly Plough & Sail is right next to the River Alde and renowned concert hall, offering a number of premium pub food options as well as the Sunday roast of the day which you’ll find on the specials boards. If you reckon you can manage it, we’d recommend the Baron Bigod brie and melba toast starter. A top-end country pub in an area filled with competition, The Ufford Crown manages to stand out on a Sunday by offering up to six different roast options and a mini roast for the kids. You can try rare Ketley beef, Dingley Dell pork belly and confit duck leg as well as several other meats that are accompanied by one of the biggest Yorkshires in the county. The Crown is exceptional at providing precisely what you need, whether that be a real ale, locally sourced food or simply a place to relax. For over 600 years The Bell has sat next to Walberswick beach, providing weary walkers refuge from the coastal elements with its quirky mix of alcoves and snugs. With Southwold just across the River Blyth, you know your Sunday meal will be perfectly supported by an Adnams Ghost Ship or Broadside. As it’s so close to the sea it only seems right that we recommend the potted crab to start followed by the fish pie. Once you’ve taken in the medieval interior of the neighbouring Church of St Mary, nip through the gate leading you to The Dennington Queen’s beautiful garden for a Sunday meal on the sheltered decking. Its 16th century wooden interior is equally as stunning, providing a relaxed, old-fashioned setting from which to enjoy the tempting pan roasted guinea fowl or any of the three roasts on offer. Join walkers, sailors and bird-watchers at this riverside pub for spectacular views of the Deben best enjoyed from the terrace with a Ramsholt fish platter. During the summer months such seafood is locally caught, ensuring a freshness other pubs could only wish for. Roasts are still on offer and after you’ve finished, grab a drink and watch the sun slowly dip below the horizon. Named as the ‘Best Pub in Suffolk’ for 2016/17, this 16th century gastropub has rightfully earned acclaim from a number of respected outlets. Inspired by whatever local produce he receives, accomplished head chef Dave Wall creates unfussy dishes with Italian twists. For a personalised Sunday experience like no other, get family and friends together for a private bespoke three-course roast, allowing you to choose from Unruly suckling pig, stuffed Sutton Hoo chicken or Dingley Dell pork. Following a highly-recommended return walk through the Westleton Nature Reserve to the Crown’s sister location, The Ship, a two or three course Sunday lunch will be just what the doctor ordered. This 12th century former coaching inn is dog-friendly so your well-behaved pooch can join you for lunch in the cosy bar or roam around the garden while you enjoy a rump of Suffolk beef followed by a dark chocolate and ale cake. There are many ways you could arrive at this smart riverside pub but we think it’s best to hire a canoe from Sudbury, dock your vessel on the banks of the River Stour and head inside for some contemporary pub favourites. To refresh and refuel after the two-mile paddle you have 16 draft beers to choose from and a selection of steaks cooked in the Inka charcoal oven. From April to September an outdoor dining area is hugely popular with families and tourists exploring the glorious Suffolk countryside. This 16th century Tudor inn may have no qualms about embracing its status as a traditional country pub, but that doesn’t mean they don’t take their food seriously. A diverse Sunday menu will change with the seasons and some of the vegetables that make part of the three available roasts will come from the pub’s own garden. If locally shot game is on the specials board, consider yourself incredibly lucky and order it immediately. While you wait for your meal, take a seat in the terrace of this beautiful red-brick inn and watch sailboats bob gently on the River Deben. It’s a wonderfully serene vista that will undoubtedly stick in your mind. The fresh, seasonal food will likely have the same effect: Deben mussels and locally caught lobster as part of fruit de mer are just a couple of ‘catch of the day’ specials made all the more enticing by their nearby provenance. When you’re done, drop below the terrace for a relaxing stroll on a surprisingly sandy beach. Grundisburgh’s only pub has a distinctive mix of features that make it well worth a short diversion off the A12: innovative takes on pub grub, an enormous choice of gins and an enclosed Mediterranean-style garden all contribute to The Dog’s unique appeal. As well as the family-oriented Sunday menu, you can try pizza from their wood-fired oven – not the most traditional Sunday dish but well worth a try. As the name would suggest, dogs are welcome throughout the premises – what’s not to love? Originally the 18th century home to the estate manager of Heveningham Hall – especially worth visiting during their country fair in July – this country pub sees locals and visitors happily mix in a traditional setting. Fronted by a village green, you can expect a friendly reception from the owners and hefty portions of honest, freshly cooked food. For a relaxed after meal activity, a petanque pitch is available for a little competitive fun. Since reopening in 2015, owner and head chef Richard Andrews has revived the fortunes of this 18th century red-brick country pub through a renovation respecting the property’s period features and by offering a quality menu you can rely on. On Sundays, reasonably-priced beef and pork roasts are available alongside the sea bass and a mushroom linguine. Further vegetarian options can be provided if you ask at the bar, but don’t head back to your table without picking up a pint from the Green Jack brewery. 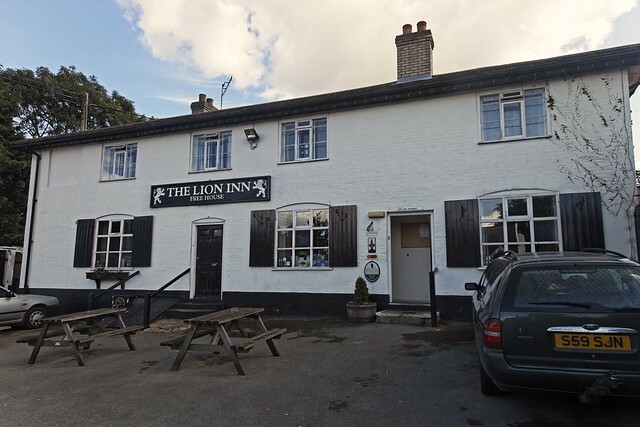 If you’re looking for a relatively unexplored old world pub experience – right down to that wonderfully indescribable old-fashioned pub smell – then The Lion Inn between Marlesford and Stratford St Andrew is the place for you. All food on the massively varied menu is home cooked to order and you’re sure to receive warm, personal service from Avril, all of which contributes to a welcoming Sunday vibe matching the surrounding Suffolk countryside. A grade II* listed former Guildhall first built in 1509, The Fox and Goose possesses a varied Sunday menu catering for both classic and more modern inclinations. Most of the produce comes from sources located within a 6-mile radius of Fressingfield and the origin of every vegetable, meat and beverage can be viewed on their website. We reckon the banana panna cotta sounds like a great way to follow the skate wing with mushroom gnocchi. When new landlord Darren Turner reopened this coaching inn built in 1480, Hoxne regained a real hub of the local community. He and wife Angela listened to what local people wanted and The Swan is now Camra’s 2017 ‘Pub of the Year’ for North Suffolk. As well as four different roast meat options and a vegetarian tartlet, there are five or six other Sunday dishes that vary weekly. With roaring log fires, an interior mixing brickwork with original wood and gravity fed ale, The Swan ticks many boxes. There can’t be many pubs out there that are quite as diversified as this 16th century pub named after the de la Pole family: there’s the usual bar, a deli counter promoting local goods, a café area and a restaurant area for the Sunday carvery. This original approach has only been going since March 2017 but it suits a building that is full of character, including wooden vaulted ceilings. Close to Wingfield Castle and the College, it’s a great starting spot from which to explore the royal history of the de la Poles. This family-run country pub dates back to 1350 AD and, despite the new thatch and recent renovation, maintains the feel of an establishment that could easily have existed in the late Middle Ages. There are a choice of meats available for the excellent value Sunday roast while other pub staples like scampi and steak and stilton pie fill out the menu for those not craving a roast.